On Second Scoop: Ice Cream Reviews: More Housecleaning: Ice Cream Cakes! More Housecleaning: Ice Cream Cakes! Housecleaning #3: My wife took two cracks at making ice cream cakes this summer. She had taken our daughter to a birthday party (while I watched baby boy) and the kids got to dive into an ice cream sandwich cake. Since I wasn't there to try it, my wife made me one! 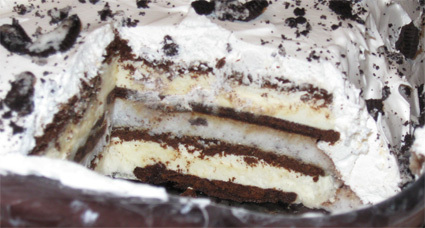 So the recipe for this is that you lay down a layer of ice cream sandwiches, a layer of jell-o pudding (she used cookies & cream), another layer of ice cream sandwiches, a healthy coating of coolwhip, and then crushed Oreos on top. My only problem with it was the way the jell-o froze. I just don't like the way it freezes and crunches... it's unnatural or something and just kind of ruined the whole treat for me --- yes, I could let it sit and melt to get soft, but it's the middle layer so it's the last part to melt and I'm just not that patient. Ok, it's good old fashion combo time for cake #2. There's pretty much no end to how many combinations you can work out here. 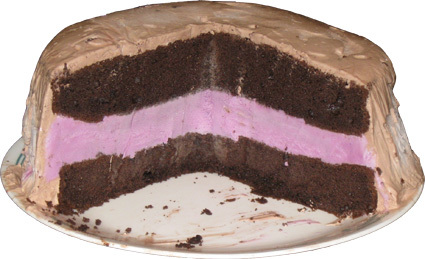 Our particular experiment is a layer of Friendly's Black Raspberry ice cream between layers of dark chocolate cake. The frosting is chocolate jell-o mixed into CoolWhip (note: i just saw limited edition chocolate coolwhip at the grocery store so that would save a step). If you've been reading the blog for a long time, you may remember I made some chocolate chocolate chip cookie black raspberry ice cream sandwiches so we had a feeling this was going to be a pretty good combo. I like how it turned out, but if we do it again I think I would try to find a way to add some crunch to it. The coolwhip is just fluff so if we could add some crunchy flat chocolate chips into the cake or frosting somehow i think the creamy raspberry + chocolate cake + nice crunch would be just awesome.